2nd officers is a ship crew and have a position on the ship as an officer under the control of the captain must have ship security officer certificate. - Duty keep navigation 00:00 - 04:00 and 12:00 - 16:00. - Practice administration pavilion, books, flag and equipment navigation. - Maintenance books navigation and map correction. - Treat and maintain all tool and equipment navigation. - Treat care and maintain the figure of things include flags, lamps navigation and tool gesture. - Maintain tool communication and equipment. - Work together with KKM for prepare voyage report. - Help chief officer in handling charge. - Prepare every report weather all it takes work together. - Practice task as officers health, prepare and ensure that supply of equipment health and drugs are enough. 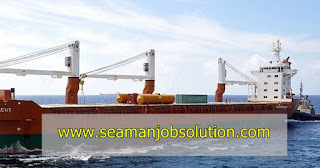 - Practice other task is given by ship captain. Share to knowledge seaman job description. 0 Response to "Job Description & Responsibilities 2nd Officers On Ship"